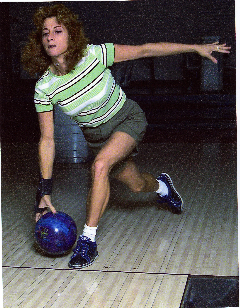 Bowling champion Michelle Silver holds six Western Women’s Professional Bowling titles and one Pacific Women’s Bowling Association regional title, plus four California Women’s Bowling Association State titles. Silver carried an average of 200+ since 1986, and has ranked among the Top Ten averages and Top Ten money earners over the last decade-plus. Michelle has rolled 16 sanctioned 300 games, including six during one season; plus two 299 games and two 298 games. She has also bowled three sanctioned 800+ series. Still very active, her career high year-long averages were 227 (2001/2002), and 221 (2005/2006). Michelle was elected to the L.A. Women’s Bowling Association Hall of Fame in 2000; was WWPB Bowler of the Year in 2001; and inducted into the California Women’s Bowling Association Hall of Fame in 2003.